Vintage Shoe Photo Tiles~These are too cute! They measure a little more than 1/2" wide and almost 3/4" from top to bottom. Made of cast metal, they have two holes on each side so that if you wish, you could incorporate them into a necklace or bracelet. You can just glue them to your book, card, etc. Package of 3. Oriental Coin~This coin reproduction has images on one side and dates on the other. . It measures approx. 1" in diameter. It is thin, so could easily be used in scrapbooks. The center hole measures 1/4" across. Package of 10. Bead Bar Pin -If you are like me, you have beautiful beads you would love to use, but don't want to give them away. This is the perfect solution. 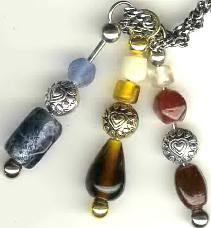 With the bead pin, you can showcase and display your favorite beads. You unscrew the end, slip your beads on, reattach end and you are ready to go. 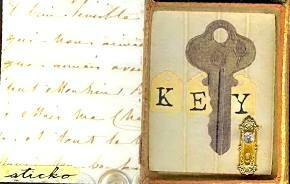 You can display them on a chain around your neck, on a keychain, use with ribbon as a bookmark or whatever else your imagination dictates. I think they would make great doll arm or legs. You can rearrange them often to showcase all of your favorite beads. Comes in gold or silver and measures approx. 2 1/4 " long. They do not work with small hole beads. 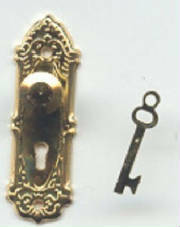 Door Knob & Key Set ~ These are just too cute! The door knob part measures approx. 1" and the key measures approx. 1/2" and comes in brightly polished gold tone. Just think of the possibilities with this fun embellishment. 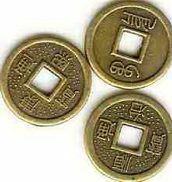 Oriental Ching Coins~ Measure 13 mm and have a square center hole. Different image on front & back. Pkg of 10 coins. Wire Swirls~ Brightly colored swirls, approx. 0.5 oz (approx 70 pcs. pkg) of 24 gauge wire. Colors include copper, silver, gold, purple, red, turquoise. I think these would be cute hot glued onto the wavy box corners. Try gluing them with your colored hot glues.